Thinking about settling down with a big bowl of chili makes my mouth water in the truest sense of the word and spreads a warmth over my body. Also called 'chili con carne', Spanish for 'chili with meat', the rustic combination of chili peppers, meat, tomatoes, and beans seems innate, a recipe that barely even needs a recipe. But it's a hotly debated one, lines drawn over what's authentic and what's blaspheme. To this day the states Texas, New Mexico, and Arizona fervently debate where the first chili con carne was invented. Today we will go in search of the original recipe of the stew, tell you step-by-step how to cook chili, and which mistakes you just don't need to make. We'll start our journey in 19th century Texas. Cowboys warming around a fire are said to have warmed themselves through, from the inside out, with big bowls of chili. Dried beef, chilis, and certain spices were cheap, non-perishable ingredients that always fit in a saddlebag. A long storage life was most arguably the reason why chili con carne became an inherent part of the cowboy diet and later even army troops are known to have cooked up big pots of chili. The Texan original recipe is just a simple stew made of beef, dried chilis, broth, and lots of time. There are only a few ingredients, but they are carefully selected and prepared. Let's have a closer look at the single components for your perfect chili. The best chilis make the most of the four distinct chili flavor profiles. Firstly the sweet, fresh chilis like the Anaheim from New Mexico, the hot tear-bringing Pequin or Arbol, smoked Chipotles, and those ones with special fruity aromas like Ancho which is a bit reminiscent of plums and tobacco. Depending on preference, every chili-lover can find their personal balance. In most places you can find speciality stores with a variety of dried chilis or simply buy them online. Using a vegetable chopper or mortar and pestle, the chilis can be pummeled well, but it's not necessary to have a super fine powder because the tough fibers will dissolve during cooking. In fact, Texan recipes usually call to boil the whole dried chili together with the meat and hearty broth. The meat is the second most important element of chili. True to the original, beef is the most commonly used meat. Tough, fatty cuts from the neck, shoulder, or shank are well suited for the slowly simmering dish. Sliced in big cubes and seared before being mixed with the remaining ingredients, the meat will be tender in a few hours and have the full flavor from the chili. Outside cities like Dallas, Phoenix, and Albuquerque many chefs have changed the original recipes, added something special, or swapped the meat for pork, turkey, venison, boar, or rabbit. Ground meat can also be used, but choosing a ground meat with a high meat to fat ratio is best. Apart from meat and chili, there's a lot of freedom to explore. 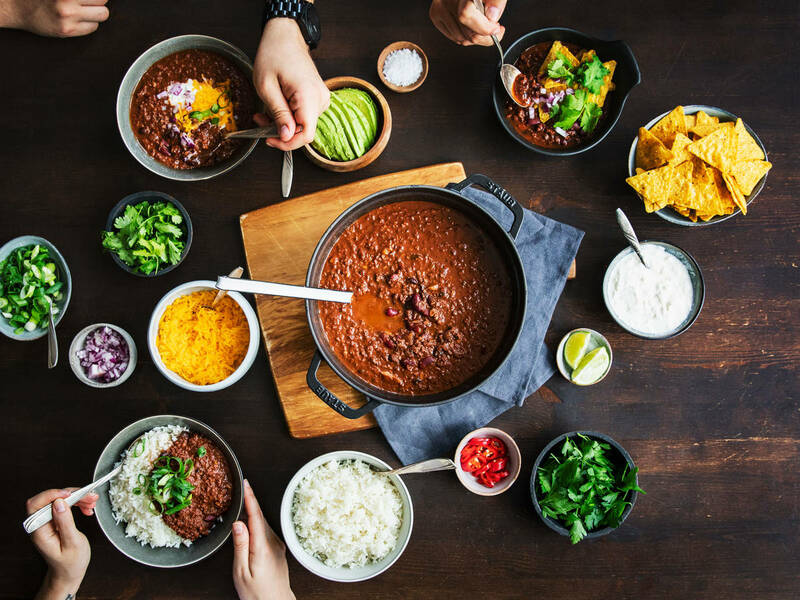 One of the best parts about cooking chili is that every recipe can be different: hot, mild, with or without beans, added vegetables, and new spices to taste. For me beans are an absolute must just as onions and garlic as special aroma, but there’s room for creativity: try adding corn, grated carrot, chocolate, or even dried tomatoes. Different spices from dried oregano, rosemary, or thyme to bay leaves, and even cumin can make your chili taste much more interesting. Of course, ready-made spice mixtures are tempting, but it's easy enough to make the mix at home. Grab some various flavored dried chilis, good paprika powder (smoked, if you want to), and a teaspoon of cumin seeds and roast them all together in a warm frying pan in order to develop their aroma. Afterwards, grind in a mortar and pestle or spice grinder. People do not only argue about the best recipe but also about secret ingredients. Some chefs prefer red wine or sherry that tenderizes the meat. Coffee and chocolate have also proved to be popular. Frying chopped bacon together with meat adds a nice flavor as well. A true chili-fan does not need more than a spoon for his steaming bowl, but feel free top with a tiny bit of sour cream or yogurt, freshly chopped coriander, grated cheese, sliced scallions, avocado, tortilla chips, or rice. 1) Peel and finely chop onions and garlic. Put some oil and meat of choice into the pot over high heat. It is important to sear the meat until well browned. When you have a large amount of meat, sear it in batches. 2) Once meat is well browned, add onions and garlic. Then add your grated chili and spice mixture and stir into the meat. 3) Add beans, followed by other vegetables of choice. Fill up with crushed tomatoes and a strong meat stock in a ratio of 2:1. Make sure that the beans and meat are fully covered. Finally, season with salt, place lid over at a bit of an angle to let some steam out, and reduce heat so the mixture is simmering. Simmer for approx. 1 hr, stirring occasionally. 4) The chili is ready when the liquid has boiled down and thickened. Some burst beans are always a good sign. Remove the pot from heat and let rest for 20 min. before serving with toppings of your choice. Have a secret chili con carne recipe? Tell us in the comments or send your favorite recipe to community@kitchenstories.com.